Even though Google had released Android 7.0 late last year, Samsung launched this year’s variant of the Galaxy A7 with Android 6.0. However, Samsung has now started rolling out the Android 7.0 update for the Galaxy A7 (2017) in India. 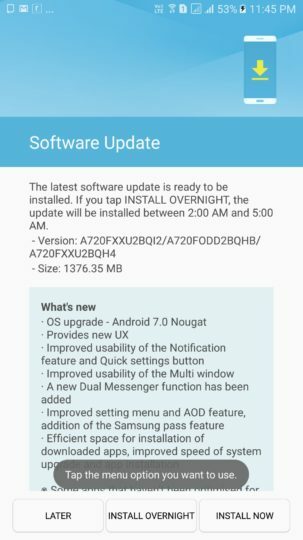 The Nougat-based update for the Galaxy A7 (2017) (SM-A720F) uses firmware version A720FXXU2BQI2 and has a file size of 1376.35MB. Samsung has started rolling it out over OTA, and it should reach most users in the country soon. Apart from Android 7.0, the update brings a new user experience to the Galaxy A7 (2017). It also comes with improved notifications and Quick Settings features, multi-window, Dual Messenger, Samsung Pass, and improvements to AOD and app installation times. If you’re from India, have you received this update on your Galaxy A7 (2017) yet? Let us and other readers know in the comments section below. After receiving Wi-Fi certification for the Galaxy A7 (2017) running Android 7.0, the company had released the update in Thailand one month ago. Thanks for the tip, Clive Cardoz! the a5 &a3 were updated in iran but a7 not updated yet. is there any problem with a7 2017 iran rom ? when androin 7 come for A7 2017 in Iran? Meanwhile in Brazil we are still waitIng for A7 2017 Nougat Update. I think brazilian Samsung Joke of us. A5 2017 received this update one month ago. Waiting for c7 pro indian models android N update…. My a5 got it in aug 24th. Here in Philippines I got an update via Ota on my A7 2017.nougat is the best there’s a lot of changes of course the Samsung experience 8.1. Thanks samsung for the update. Oh nice ! I will check updates on my A320FL from France tonight. samsung is getting wrost. no updates. better will buy another cell next time.